It was already 8pm on a toasty summer night when our group assembled at the place Italians call “the Wedding Cake.” The massive, white marble building known officially as Vittorio Emanuele Monument was the meeting point for our night tour of some of the most famous remains of ancient Rome – the Colosseum, the Roman Forum, and the other amazing ruins that line the path between the sites. We were beyond excited. It’s important to note that this part of Rome is my favorite place on the planet. When Lance and I visited it for the first time nine years ago, I actually did the happy dance while strolling through the Forum…and I may have done it again while gazing across the breathtaking structure that is the Colosseum. We have a thing for grand ruins. While we have been back to Rome several times since, we haven’t had the chance for another proper exploration, mostly due to the long lines that form for the sites during the day. Our night tour with Walks of Italy began with a walk to the Capitoline Hill to visit Piazza del Campidoglio. 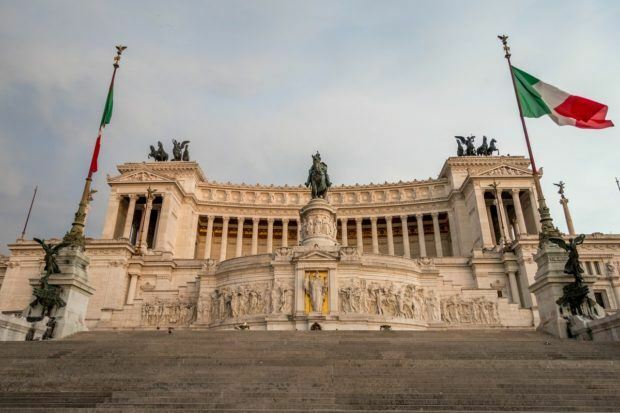 The spectacular square, which dates from the 16th century, was designed by Michelangelo. From this elevated viewpoint, we got a fantastic look at my beloved Roman Forum—the space that was the heart of life in ancient Rome. 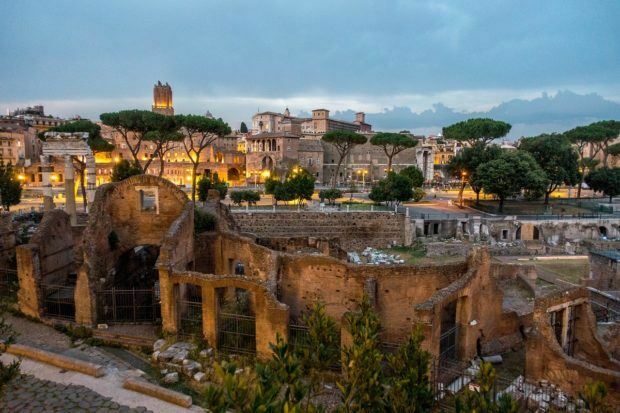 Although the site is closed at night, seeing the Forum from above gave us a great appreciation for the scale of the historic buildings and what still exists here. 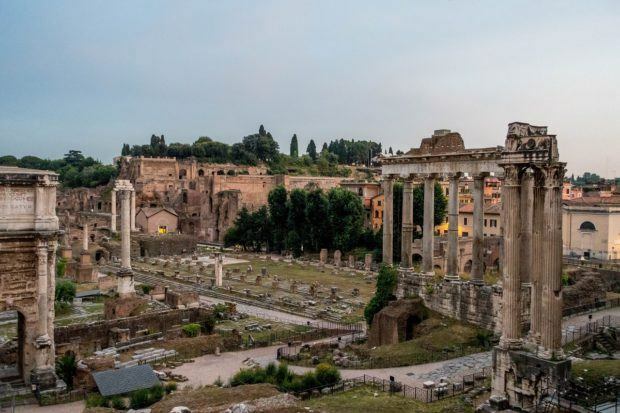 It’s easy to imagine the size and detail of the temples and monuments whose foundations and columns are still sprinkled within the Forum’s footprint. As our tour continued, our guide told us about the “archaeological lasagna” that is Rome. The evidence was literally all around us as we passed early Christian art, ancient monuments, and the works of emperors on our short journey. 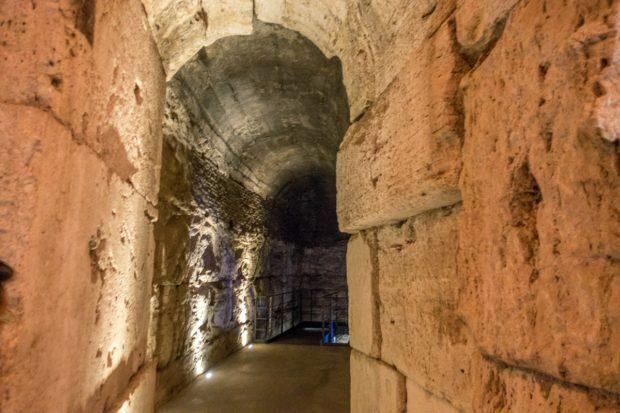 For centuries in Rome, settlements were built on top of settlements, leading to layers of buildings, tunnels, and artifacts all within the city’s core. 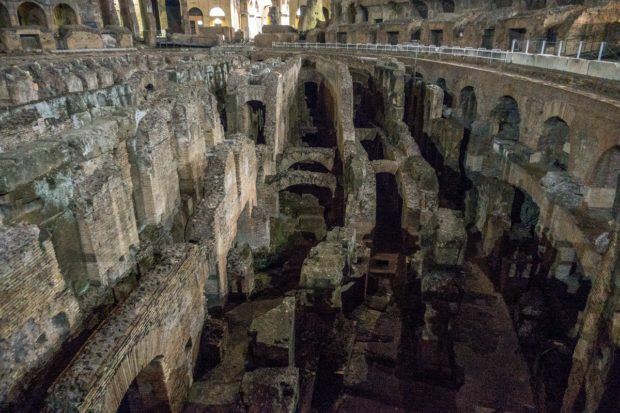 As we walked toward our ultimate destination—the Colosseum—we gazed 20 feet down below ground level to the base of some of the ancient structures. And that’s just what’s visible now. Ongoing excavation for a new subway line (which many locals think may never be completed) is constantly uncovering things like preserved mosaics from the earliest neighborhoods, burial grounds, and artifacts of daily living. 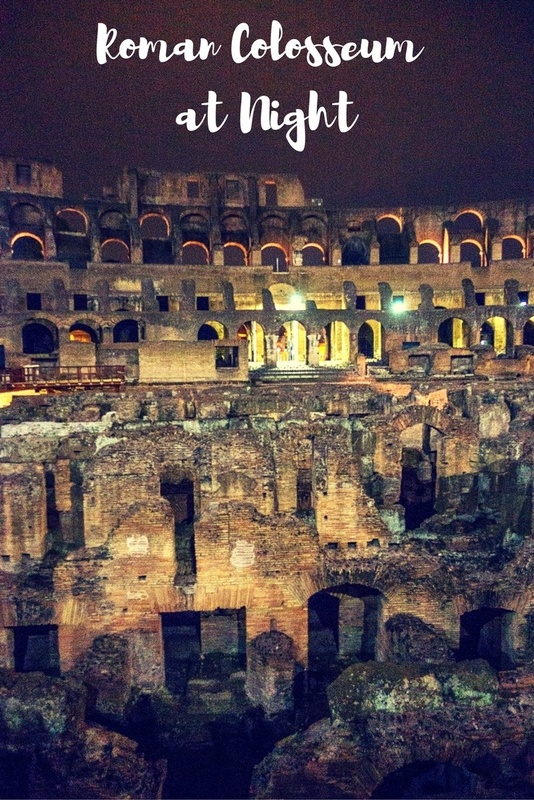 After weaving our way passed the street artists and vendors entertaining passersby, we arrived at the Colosseum at our appointed time for our night tour. Because visiting the Colosseum at night is tightly controlled and limited to small groups (ours was only about 25 people), the start time is quite specific. We had a few minutes to marvel at the 2000-year-old building lit up against the night sky, but it was soon time to go inside. Passing through the arches of the Colosseum, we found ourselves standing in the former location of the imperial box, gazing over the partially-reconstructed floor. The first things we noticed entering this amazing building were the network of tunnels below and the absolute silence of the night. Visiting the Colosseum during the day can be quite hectic between the heat and the lines of people. But, at night, it was just stillness, giving us an opportunity to take in the grandeur of the structure while learning more about what happened here. Our Walks of Italy guide told the story of the Colosseum, originally known as the Flavian Amphitheater. 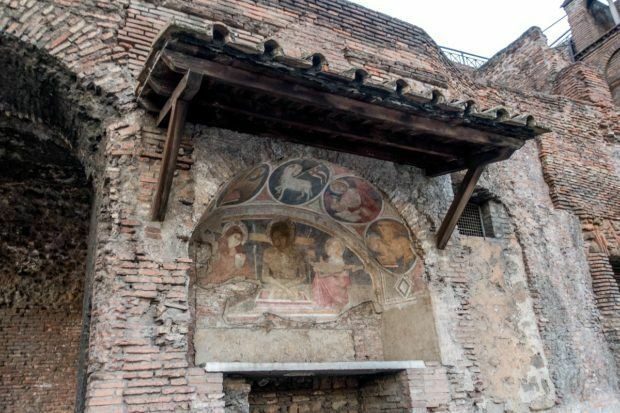 Beginning around 80 AD, it hosted upwards of 50,000 fans taking in the entertainment of the day. Often, that meant great displays of exotic animals from around the world. Elephants, lions, tigers, and more would be brought in from Africa to fight to the death, or sometimes to fight with people who had been condemned for different transgressions. (Despite the legends, there is no evidence that Christians were executed here). As part of the all-day events, the animal battles were followed by the peoples’ favorite – gladiator fights. Trained specialists from across the Empire would duel for glory while the citizens cheered, picnicked, and gossiped during these social times. It continued this way for 500 years until the fall of the Roman Empire. Making all these spectacles happen took a small army (or at least a sizable group of slaves and low-level workers) who were almost always out of sight of the nobles and public at large. 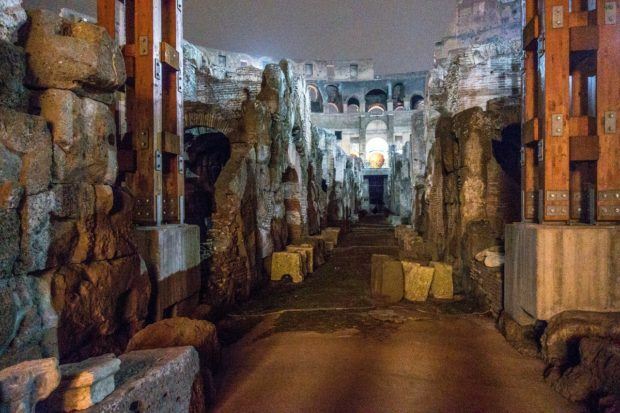 The next stop on our Colosseum night tour was the hypogeum, the underground area where all those people worked. 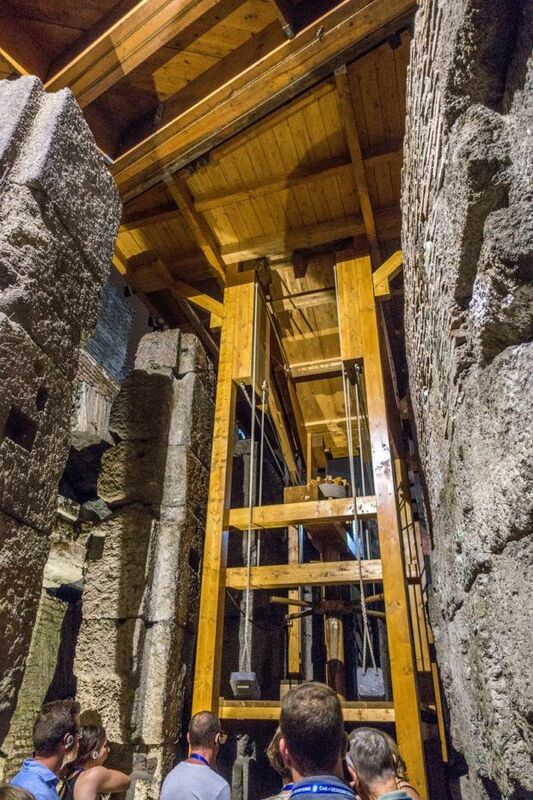 Below the floor of the Colosseum is a system of twisting tunnels and corridors. These spaces once housed the animals being prepared for battle, the gladiators awaiting their next duel, and all the other unfortunate souls soon to find themselves in the middle of the arena. Seeing the narrow spaces that would have been dark, hot, and full of activity, it’s hard to imagine how everything worked below ground. But it did. We even had the opportunity to see a reconstructed version of the elevators that were used to hoist the people, animals, and equipment up to the arena floor. After a look at a few more of the tunnels and pathways, our time at the Colosseum was up. It was time to re-emerge into modern Rome to admire the ancient building from the outside, doing the happy dance once again. 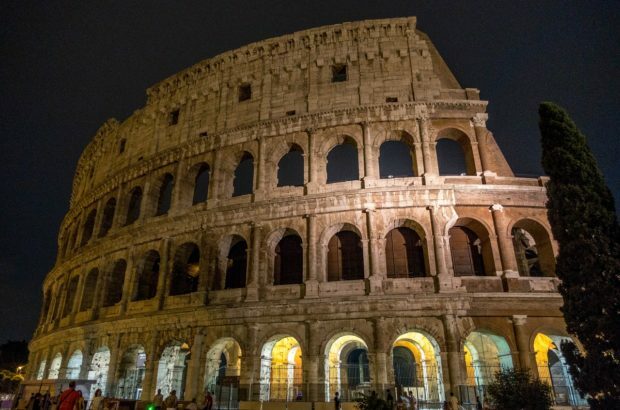 When: The tour of the Colosseum is typically offered four nights per week and lasts about 2 hours. 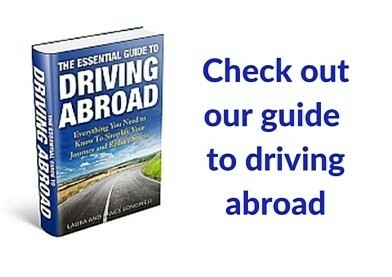 Please consult the website for exact dates. 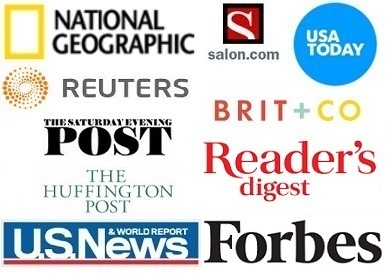 About Walks of Italy: The company offers over 70 services in cities across Italy. 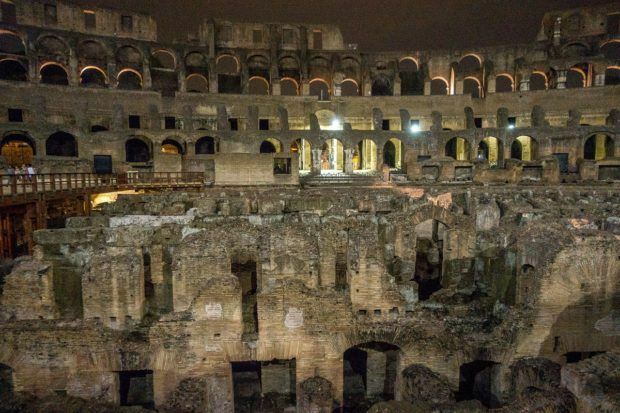 Website: See the VIP Colosseum at Night tour. We were the guests of Walks of Italy. All opinions of the fascinating and ancient are our own.